Make your own papercraft deer trophy with our printable PDF template! 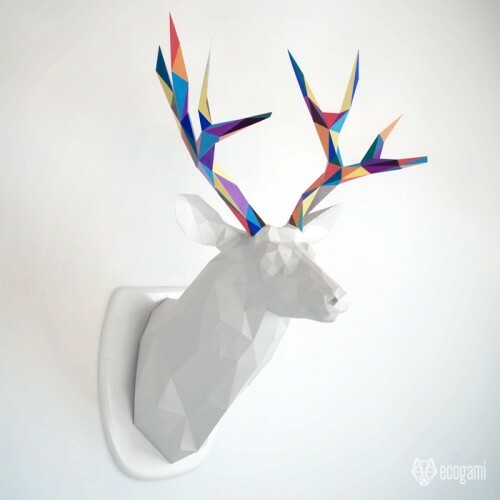 Just follow the instructions & you will be proud of your low poly deer head. Isn’t it a beautiful wall mount for your living room or even a gift - not assembled for a modeling lover or already assembled for a nature lover? Don’t be afraid, I assembled the sculpture so everybody can do it! You will just need time & precision. Put your music on & enjoy the assemblage! (For me it is a perfect way to relax). ► Print the template (choose the sheet format which is more convenient for you, the size of the sculpture is the same with A3 or A4 paper). The paper has to be thick (200 / 300 gsm / grams per square meters). The one I use is 270 gsm & it is perfect for that kind of sculpture. You can print at home if you have a printer or, easier, go to the nearest Print shop, you could buy the paper & print there. ► Once finished, you can personalized the sculpture according to your taste. The customization options are infinite! You can color each face with felt-tip pens to make it multi-colors (I did it for several models). Or, you can paint it to make it stronger & easier to be cleaned. With an oil paint or even spray paint, it will look like laminated & your friends won’t believe you made it with paper! ► Difficulty Level: Hard - the horns need precision. It is better if you already have an experience in papercrafting for this model.